EARLY ON 10 June 1984, a Minuteman intercontinental ballistic missile blasted off from the Vandenberg Air Force base in California heading west across the Pacific Ocean. Moments later, on the other side of the international date-line in the US Marshall Islands, a second missile was launched. What happened next thrilled the then President of the United States, Ronald Reagan, and frightened the Kremlin in Moscow. It helped to alter the course of Soviet- American arms control. But it may also have been one of the more extravagant and brazen lies of the Cold War’s dying years. Equipped with infra-red sensors capable of detecting heat from a body at 1,000 miles, the second missile hurtled towards the travelling Minuteman, closing in on it at a speed of 15,000 miles per hour. Exactly as planned, impact occurred 100 miles above the ocean, pulverising both projectiles in a searing explosion meticulously recorded by military engineers below. The interception was instantly held up by Washington as the first proof of the feasibility of President Reagan’s elaborate proposal for a space- based shield to protect America from incoming missiles, known officially as the Strategic Defense Initiative (SDI) but already dubbed by doubters as Star Wars after the science-fiction film. The out- of-atmosphere head-on collision, the Pentagon boasted, had amounted to ‘hitting a bullet with a bullet’. Nine years on, the consequences of the experiment are hard to judge precisely. 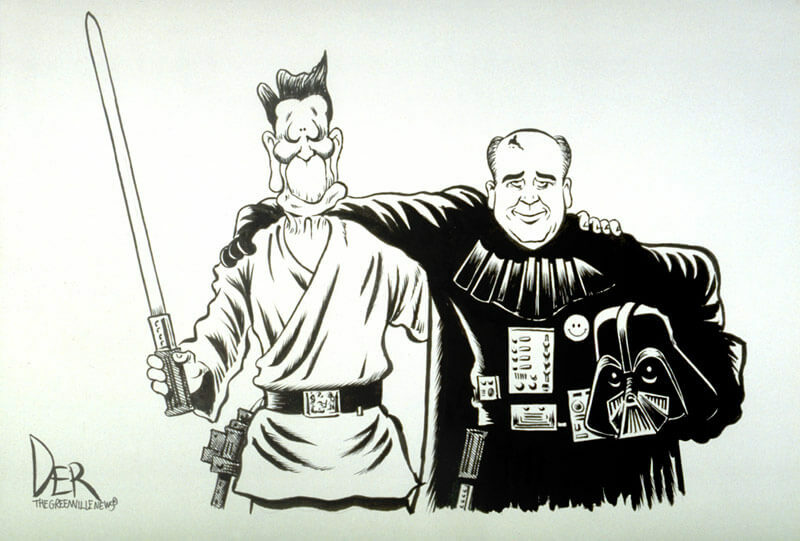 But it certainly strengthened Mr Reagan’s hand at a crucial time in pursuing the Star Wars project against deepening scepticism in Congress and among America’s allies. Most significantly, it gave him important new leverage in subsequently pressuring Moscow into the disarmament process that eventually led to the Start treaties on slashing nuclear arsenals. Now, however, allegations are being made that the entire experiment was a scientific fraud. According to a New York Times report based on interviews with four unidentified former Reagan officials, the two missiles had secretly been fitted with radio beacons to guarantee their meeting in space. This small but vital detail was apparently withheld as part of a general policy of ‘strategic deception’ at the heart of the SDI – the feeding to the Soviet enemy of lies about the project’s progress and technological content. It seems that in this case, however, others were also misled: the US Congress – which over the ensuing years dedicated dollars 30bn ( pounds 20bn) to the programme – the American public and, by extension, the Nato allies, including Britain. Anticipating indignation on Capitol Hill, the Clinton administration has ordered an official investigation into the claims. ‘Any allegation that the Congress has been misled raises serious questions,’ the Defense Secretary, Les Aspin, said, announcing the inquiry. Without an on-the-record confession from someone involved, the full truth may never be established. The denials, meanwhile, have flowed in. Caspar Weinberger, defense secretary at the time, dismissed the notion even of a deception programme as ‘quite absurd’. ‘The Soviets were perfectly well aware of most of what we were doing, and could read most of our data as well as we could theirs,’ he said. William Inglis, who was civilian test director for the programme, has admitted there were beacons on the missiles, but insists that they were only for safety purposes to ensure they could be properly tracked from the ground. From the moment President Reagan unwrapped his Star Wars surprise in a national television broadcast on 23 March 1983, it had the whiff of science-fiction about it. Offering the vision of an umbrella in space that would protect all of America from Soviet nuclear attack, he declared it would ‘give us the means of rendering these nuclear weapons impotent and obsolete’. His enthusiasm, which remained undented throughout his presidency, was fired largely by Dr Edward Teller, the nuclear scientist and father of the hydrogen bomb. Teller – whose other claim on posterity is as the inspiration for Dr Strangelove in the Peter Sellers classic – promised an array of space-based weaponry, including nuclear-generated X- rays and neutron beams, all of which have since proved unworkable. Looking back, it is easy to wonder just who did accept the early version of Star Wars. The few may not have extended far beyond President Reagan himself and a handful of generals in Moscow. The leverage case was rehearsed last week by President Reagan’s national security advisor, Robert McFarlane, who responded in the New York Times to the earlier allegations. The importance of Star Wars, he argued, was its role in persuading the Soviet Union to accept the arms reduction process and, in time, Start itself. This is about more than history, however. Only four days ago another rocket was launched over the Pacific in an experiment undertaken as part of the new, slimmed down version of Star Wars announced by Mr Aspin last May. He stripped it of its old SDI title and renamed it the Ballistic Missile Defense programme. While about one third of the still considerable funding – dollars 3bn in 1995 – will go towards developing a national anti-missile defence system, most of the remainder is to be dedicated to finding new anti-missile weapons for use in regional warfare. Under the Aspin doctrine, meanwhile, the perceived threat is no longer Moscow but the proliferation of nuclear technology among Third World states. And the Europeans, who may feel themselves more at risk in these new circumstances than the Americans, are suddenly very anxious that the American research should continue. Thursday’s test, for example, which was designed to test an interceptor’s ability to distinguish a decoy from a real missile, was launched jointly by America and Britain. But if anger over the alleged 1984 fraud builds, support on Capitol Hill for any further Star Wars research at any level could evaporate, leaving the allies disappointed. In a private letter from Senator Pryor to Mr Aspin the Senator wrote that ‘congressional and public confidence in Department of Defense test results would be non-existent’.